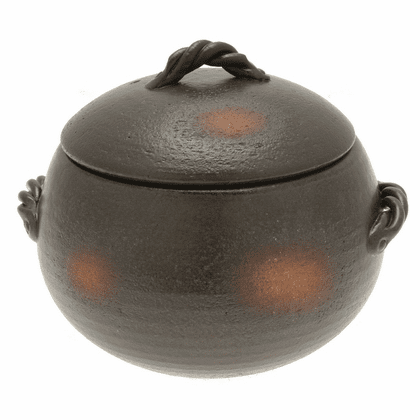 This Banko Yaki earthenware rice cooking pot makes fluffy, glistening rice and is great for making plain rice, variety of vegetable dishes and Miso soup. Microwaveable safe. First, wash 3 gou (2-1/3 cups, 540cc) rice thoroughly and then put rice with about 600 cc (2-2/3 cups) of water into the pot. Use the lines inside the pot as a guideline 2 gou and 3 gou going upward indicating the amount of water for size 3 gou pot. Use the lines inside the pot as a guideline 3 gou, 4 gou and 5 gou going upward indicating the amount of water for size 5 gou pot. Please adjust the amount of water based on your particular rice and preference. Soak the rice for at least 20 minutes. This is very important when cooking with this pot. The optimal soaking time will depend on the quality of the rice. Place cover lid on pot. Now you are ready to cook. Cooking time on a gas cook top: Cover over medium-high heat for 11-18 minutes, and then turn off heat. Shutoff time is about 3 minutes after steam starts blowing out of hole on the top lid. However, you can extend about 1-2 minutes if you wish to have a tasty okoge which is crispy toasted rice at the bottom of the pot. In case you want to make Takikomi gohan, which is mixed ingredients with rice, add ingredients at the same time as rice after steam starts low heat for 5-7 minutes cooking. Please careful spill over if you have too high heat. 7-1/8 inches in diameter (18 centimeters in diameter), 5-7/8 inches tall (14.5 centimeters tall), 3.3 pounds (1.6 kilograms), 50 fl. oz. (1,500 cc capacity) $49.95 item #190805. 8-1/8 inches in diameter (20.5 centimeters in diameter), 5-1/8 inches tall (18 centimeters tall), 4.85 pounds (2.2 kilograms), 77 fl. oz. (2,300 cc capacity), $69.95 item #190806.